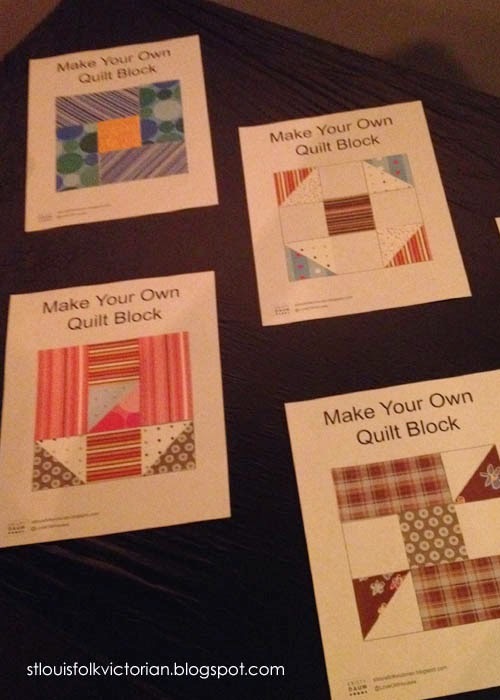 A few weeks ago, I packed up some quilts, books, paper, and glue-sticks...and headed to the St. Louis Science Center. 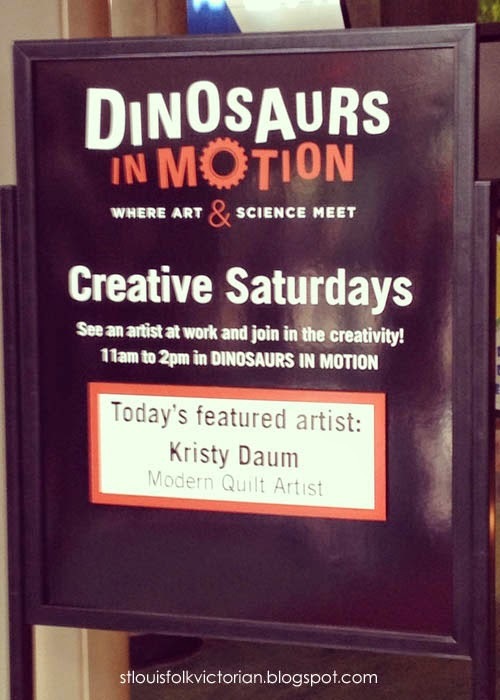 This time I was invited to be a part of their Creative Saturday series. Of course, I had to get that snapshot...it's not everyday that your name is on a sign; much less one where the main attraction is Dinosaurs. I setup my display; where I would be discussing pattern design, and sat down for what I had hoped would be a busy day. 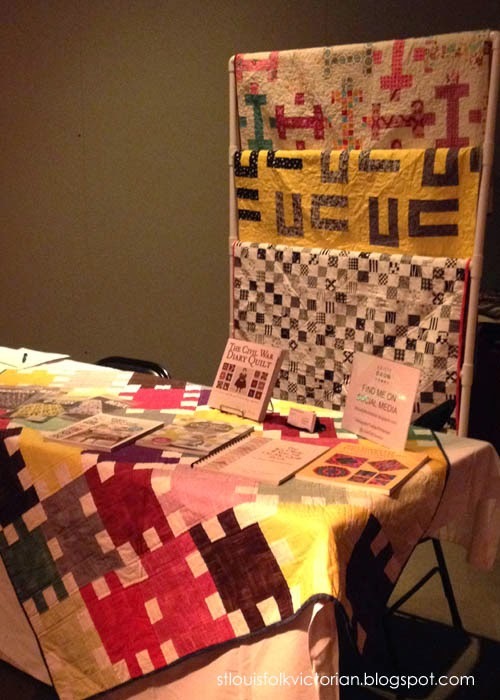 I'm passionate about quilting; but when THIS is literally 10 feet away, I wouldn't want to hear about quilting either. 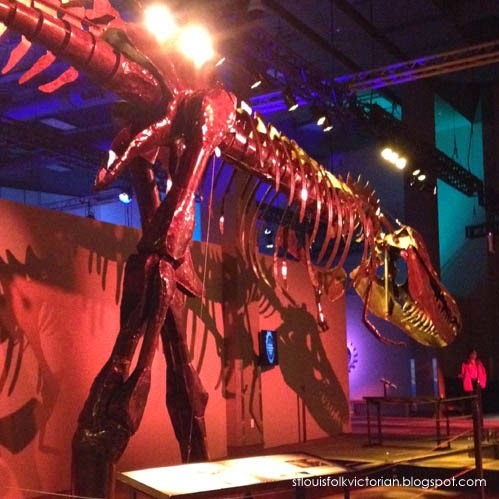 This ridiculously cool T-Rex made entirely of salvaged metal from scrapyards stole the show [by Sculptor, John Payne]. I mean, he had to be 30-40 feet long and what's even better...he actually moved. By pulling a lever, you could make this Dinosaur move...get it Dinosaurs in Motion. The day wasn't a complete bust, I did have a few curious visitors and had time enough to design a few quilt concepts along the way. One quilt design was even inspired by my bony Jurassic neighbor, we'll see if it makes it off the page and into fabric form anytime soon. T-Rex would be tough competition. 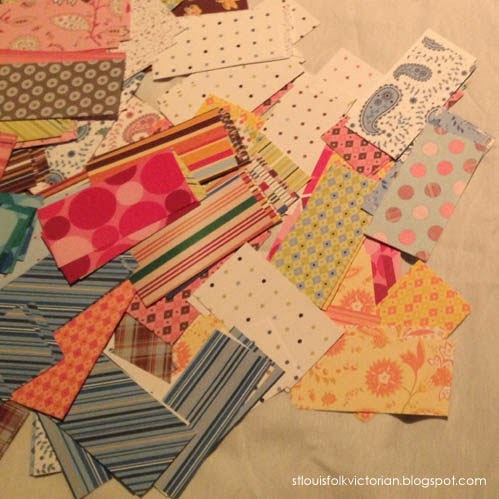 In the end, if you inspired one person to view quilting in a different/modern way, I think your efforts were worthwhile. Bummer!! I keep meaning to come see you at the science center, hopefully I will catch you next time and you will have at least one fan :) were you able to get some productive sewing done at the table? At least the setting was cool!